Just back from “Bespoked” (Bristol UK) after a few weeks holiday time after the gig. 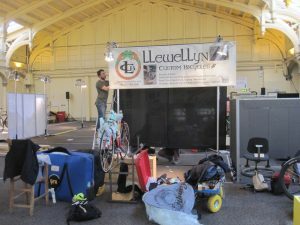 A few pics here of setting up in Brunel’s Passenger Shed. Big thanks to Robin Mather for making the display stand for “Wayne’s Obsession” and his hard work assisting in setting up. (that is Robin up the ladder) Also a big thanks to Mark Stanley for his assistance. They made it so much easier for MAM and myself after stepping off the airport shuttle bus, straight in the door of the venue to set up the stand before we even checked into our hotel digs the evening before the show kick off.